Back in 1989, all phones were landlines, a U.S. postage stamp cost 25 cents, the Berlin Wall finally fell and Nintendo released its Game Boy handheld gaming system. 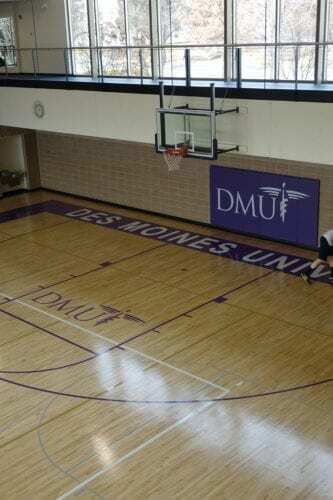 That also was the year that Des Moines University, then the University of Osteopathic Medicine and Health Sciences, launched its wellness program with a single staff member, director Joy Schiller, M.S., CHE. Are you ready to work out? Now, the University’s 25,000 square-foot Wellness Center sports a full-size gym, running track, exercise classroom, a wide variety of equipment, intramural sports and a wellness kitchen. Its Wellness Pays program offer employees financial incentives for working out, getting preventive health care and participating in other health-related activities. 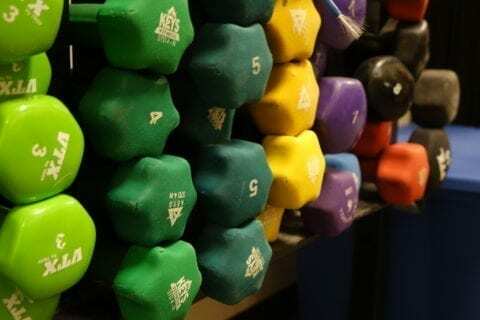 Its three full-time staff members and student employees lead a variety of exercise classes and offer individual consultations and lunch-and-learn programs. DMU’s Wellness Center includes a full-size gym. For its comprehensive wellness offerings and operating plans, the University is a finalist in the large workplace category in Iowa’s 2019 Healthiest State Annual Awards competition. Individuals, communities, schools and workplaces will be recognized for their efforts to improve the physical, social and emotional well-being of Iowans in their respective sectors. DMU was a finalist in the competition last year, too. Winners in each category will be announced at the Healthiest State Annual Awards ceremony on Feb. 7 from 5 to 7 p.m. at the Hy-Vee Ron Pearson Center in West Des Moines. Each winner will be granted a monetary gift to continue their work focused on improving the health and well-being of their employees, students or citizens. A wide variety of classes are taught in the exercise room, including cycling, Pilates, yoga and high-intensity interval training. In addition to being recognized as a Healthiest State Initiative finalist, DMU has twice been awarded platinum status from the Wellness Councils of America, the highest honor the organization bestows. DMU is the nation’s first and only college or university to earn this distinction. In 2018, more than 70 percent of DMU employees used the Wellness Center, logging more than 8,100 visits. Approximately 4,600 individuals participated in exercise classes. Also in the past year, the program has offered Weight Watchers at Work, launched a DMU book club for intellectual and social wellness, and enabled employees and students to purchase “shares” of produce supplied by a local farm. “Promoting wellness is central to the principles of osteopathic medicine and permeates the approaches to training in all of our health professions programs,” Joy says.